“I was a 28-year-old kid and I didn’t stop to ruminate about it. I didn’t think, ‘My God, we’ve changed the history of the world!’”. – Glenn T. Seaborg, Nobel Prize winner and Manhattan Project Scientist, from a 1947 interview, on his discovery of plutonium six years earlier. I believe that the discovery of plutonium, and its subsequent use in nuclear weapons, shaped the world in ways that are more profound, and more complex, than can be described in a single essay. There are multiple facets to how the Cold War arms race affected our world, including how our environment has been changed. After plutonium was discovered by Glenn Seaborg et al. at UC Berkeley in 1941, the decision was made to produce enough for an atomic bomb, as part of the Manhattan Project, during World War II. This was done at the B Reactor at the Hanford Site, in southeastern Washington State. The consequences of this decision, and the detonation of that bomb over Nagasaki did, indeed, change history. 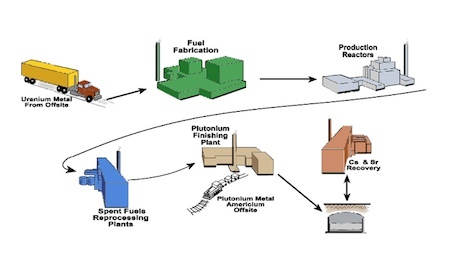 Plutonium production cycle at Hanford. Click to enlarge. The graphic betrays the complexity of the system. The waste itself is a rather nasty brew of fission products, organic solvents, and other chemicals; the geeks among you can read about the plutonium extraction and processing chemistry here. 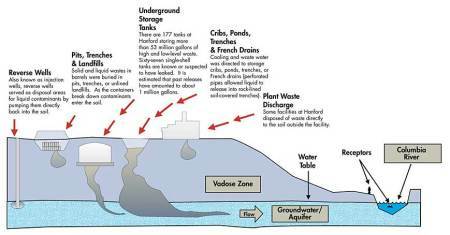 The big problem that has developed over the 67 year history of the site is the legacy of this waste, which is summarized in the following graphic. It’s leaking out of the tanks into the ground; some of it was also discharged directly into the soil in the early years of the Cold War. Old containers in trenches are leaking as well. Hanford leakage conditions. Click to enlarge. As the Cold War ended, the decision was made to take a good, hard look at these cleanup issues, and get started on environmental remediation. That was where things were when I worked as a radiochemist at the site, in the early 1990s. I was a student intern with the Department of Energy, finishing up my undergraduate chemistry degree. We were working on different (and hopefully faster) ways to analyze both tank waste and sludge from spent reactor fuel storage at the K reactor, in what was known as the K East (or KE) Basin. The reason I’m mentioning this is because, at the time, the issues we were dealing with — analysis of tank waste, measuring plutonium in reactor basin sludge — seemed absolutely intractable. I thought that it would be nearly impossible to clean up the site. The thought of cleaning nuclear waste sludge out of a reactor basin just boggled our minds. It seemed like it would be impossible to clean these things up. 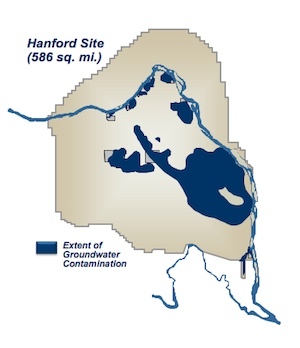 The 1.2-million-gallon basin once held 1,100 tons of uranium metal fuel rods, known as spent nuclear fuel, leftover from Hanford reactors after plutonium processing ended, as well as sludge, a byproduct of fuel corrosion during years of storage. The highly radioactive spent fuel and less radioactive sludge were stored in 20 feet of water that provided shielding. Hanford Site map (above) and Hanford groundwater contamination (below). Click each map to enlarge. The environmental legacy of making so many nuclear bombs is huge, damaging, and seemingly overwhelming. Whether we’re talking about the chemistry or the safety and engineering issues, it is also extremely complex, almost beyond description. However, enormous progress has been made. This is something that’s difficult to see unless you step back and take a look at the big picture. 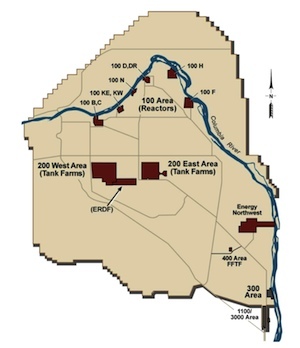 In fact, thanks to ARRA funding, work at Hanford has been accelerated. I’m going to actually visit the site in May of this year. I’ll be talking to a number of scientists and people involved in various projects; this will give me a good basis for reporting back to you guys on the progress they’ve made and the difficulties they are still encountering. To be sure, the mess can’t be sugar-coated. It’s very, very bad. However, oversimplifying it and using it as the basis for political grandstanding is dismissive of what has actually been accomplished. I don’t think hyperbole is particularly constructive. 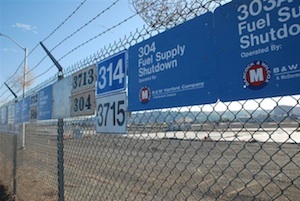 Finally, I’d like to post a significant photo from the area of the site where I used to work, called the 300 Area. Apparently, it’s become a tradition to put signs from demolished buildings on a fence. I have a feeling that I won’t recognize the place when I visit, 16 years later. Signs from demolished buildings in the 300 Area. Click to enlarge. This entry was posted in Cold War History, Environment, Hanford Site, Nuclear Weapons. Bookmark the permalink. Post a comment or leave a trackback: Trackback URL.